Many devotees lament that the ISKCON of yesteryear only exists in their memories and they long for the return of those times. Many devotees have left ISKCON believing that those times are gone forever now that Srila Prabhupada has been overshadowed by the ISKCON Leadership that took control of the Movement soon after he entered into Samadhi. However those times do still exist. They exist in the many home programs and Sunday feasts around the world where devotees congregate to share their Krsna Consciousness experiences, chant, dance and take prasadam together. It is only in the institutionally run affairs that this mood has become increasingly redundant. It is a fact that the older devotees no longer feel the love and compassion that Srila Prabhupada gave. In its place is the cold hard reality of people who only pay lip service to Srila Prabhupada and are heavy handed with the devotees who do not comply with their directives. Over the history of ISKCON, many devotees have been disenfranchised or literally kicked out of ISKCON due to the errant nature of the GBC and Rubber Stamped Gurus. The heavy handed and uncaring nature of the ISKCON Leadership has hurt / disillusioned and alienated many devotees with regards to ISKCON’s role in their life. In most cases devotees have left ISKCON and either taken shelter of their previous lifestyle / convictions or they have taken spiritual shelter outside of ISKCON. The manner in which the ISKCON Leadership has conducted its relationships with the devotional community has caused considerable misunderstanding and ambiguity amongst the faithful followers of Srila Prabhupada. Many devotees have found the GBC’s and Rubber Stamped Guru’s methodology, emphasis and developmental strategy to be incongruous with Srila Prabhupada’s, which has led to many misunderstandings within the Society. The devotee’s ambivalence and suspicion of the errant GBC and Rubber Stamped Guru’s has led the general devotee into believing that it was ISKCON that is problematic. This misunderstanding is due to the fact that the GBC and Rubber Stamped Guru masquerade as representing Srila Prabhupada and ISKCON and have held all the leadership positions since Srila Prabhupada entered into Samadhi. This is more difficult to understand for the neophyte devotee who knows no difference due to the fact that the present Rubber Stamped Guru’s have veiled Srila Prabhupada from them. The general devotee believes that since these people are in the positions that they automatically represent Srila Prabhupada. But it now seems obvious that to actually represent Srila Prabhupada and not your own agenda is as difficult as it is to become a Vaisnava! Once devotees begin to see that the GBC and Rubber Stamped Guru’s don’t represent Srila Prabhupada, they can begin to understand more clearly that Srila Prabhupada’s ISKCON is most definitely not the present day ISKCON. However, what to do about this is another problem that many devotees face. If this is not ISKCON then does Srila Prabhupada’s ISKCON actually exist in this day and age and what shall be done to rectify the situation? 1. Whether or not it is necessary for devotees to leave ISKCON and set up their own project. 2. Or is it better to take a position inside FISKCON and work with them to affect change. 3. Or is it better to stay inside and work towards change but not serve the institution in any way. These are very important points that we as a society must consider. Firstly however, I would like to address the point about perception. How one perceives any given situation is vital when understanding what solutions are best suited for that particular situation. Depending on the particular perception of the individual, they form their; conceptions, plans, methodologies, and self assessment procedures in keeping with the particular meaning that they infer from their perception. If one was to look at the historical development of ISKCON as it evolved from its roots in the Gaudiya Math under the direct auspices of Bhaktisiddhanta Saraswati Maharaja; Srila Prabhupada’s guru, we may perceive what occurred from many different perspectives. 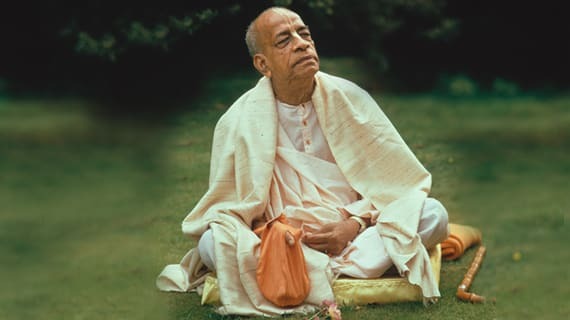 The main perspective that many devotees perceive, or have been led to believe, is that Srila Prabhupada left the Gaudiya Math and established ISKCON. Once this perception is established in a person’s mind they begin to develop a rationale and explanation of what ISKCON is and what Srila Prabhupada’s purpose is. However, perhaps there is another angle of vision that one may ‘see’ this event, an ‘angle of vision’ which has a different mindset and therefore different consequence. 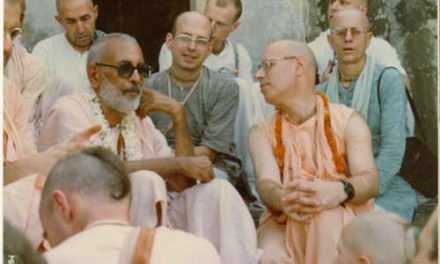 If one was to think that in actual fact Srila Prabhupada never left the Gaudiya Math and that the establishment of ISKCON was a natural evolution and development of Bhaktisiddhanta Saraswati Maharaja’s Gaudiya Math… Therefore if one was to assume this logic then by definition we are the Gaudiya Math. There is no question of Srila Prabhupada splitting away and establishing a separate mission. After all, Srila Prabhupada’s God-brothers appointed themselves as gurus formed their own Maths in much the same way as Srila Prabhupada did. In this light, to say that Srila Prabhupada left the Gaudiya Math is redundant. He most certainly did not. He was simply the most successful at developing the Gaudiya Math than his God-brothers. Perhaps Srila Prabhupada’s God-brothers also assumed that Srila Prabhupada left and established his own movement, but that is simply an assumption on their part. After all Srila Prabhupada did not exclude his god brothers from ISKCON, they excluded themselves believing that what they did by establishing their independent Maths was somehow different from what their God brother Srila Prabhupada did. This conception may go a long way in explaining why there exists in our Society the mentality that if Srila Prabhupada ‘can’ or ‘did’ leave the Gaudiya Math, it is also okay for us to do so if the ISKCON (FISCKON) that we perceive does not meet the standards that we believe it should. Perhaps to have this mentality plays right into the hands of the errant GBC who would rather that we be disunited and leave their FISKCON society to set up a society / project of our own. If we leave then we are no threat to them. They are very well aware of the fact that they hold the title ISKCON, which even as a title is very powerful. Further that the implementation of the Rubber Stamped Guru Franchise system, although it has similar infrastructure to the present day Gaudiya Math Gurus, is differentiated from it by the fact Srila Prabhupada made his position in ISKCON legally binding under the very specific tenets laid down by Srila Prabhupada in the original incorporation documentation of ISKCON. 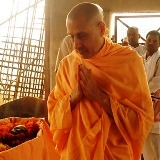 The truth is that Srila Prabhupada was clearly the empowered personality to continue with the mission of his Guru Bhaktisiddhanta Saraswati Maharaja and therefore it became evident that he was in actual fact a Shaktiavesa Avatar and therefore knew precisely how to expand and develop the Gaudiya Math (ISKCON). It is highly significant that Bhaktisiddhanta Saraswati Maharaja did not appoint an Acharya (successor) nor did our Srila Prabhupada appoint an Acharya, successor. To either be appointed as an Acharya Guru or to appoint oneself as an Acharya Guru is dependent on the ‘appointees’ actual qualification. The fact that in our line the Acharya’s did not appoint successors is very significant. So many times we see in Indian history the system of ‘appointment’ of successor Gurus; however, how many of these appointments are procedural rather than due to the appointee’s actual qualification? Gurus and disciples are common place in this Kali yuga. Almost anyone in India who gets some land builds a temple or gets on a lecture circuit can begin to attract people and commence giving diksa initiation. This is evidenced by the large number of bogus gurus who have tens of thousands or even millions of disciples even though they are known to be corrupt and/or fabricate their own siddhanta. The fact that they didn’t appoint a successor leaves one to consider that either there was no disciple qualified to take the position of Acharya or that there is some plan of Srila Prabhupada’s that we only in retrospect can discern. In recent times in the Gaudiya Vaisnava tradition we see many long-term self appointed gurus that know sastra very well and who serve a definite role within the Sampradaya, as do the many millions of followers; however, this does not naturally imply that these personalities are liberated souls (nitya/kripa/saddhana siddhas). Is the assumption correct that since Bhaktisiddhanta Saraswati Maharaja gave diksa initiation to followers that those followers after his death can automatically assume that they are qualified to also give diksa initiation? To assume that the disciple upon the death of his guru automatically is qualified is perhaps unintelligent. The fact that the self appointed guru maintains his Math for many years is also not proof of their qualification. Similarly in ISKCON – simply because the present Gurus in ISKCON have appointed themselves as Gurus and have served as such for many years does not naturally imply that they are qualified Vaisnava’s. Even though Srila Prabhupada’s Guru did not appoint him or anyone as an Acharya/Guru he did go on to follow his guru’s instructions which no one can deny. He was definitely empowered more than any other to distribute the knowledge of Sri Krsna through his worldwide book distribution program. He achieved so much in his lifetime that, in retrospect of his life, we can see that he was no ordinary personality and by the result of his seva we can also see how Sri Krsna and Lord Caitanya Mahaprabhu afforded him so much mercy and service on a global scale that one is humbled at his achievements. Srila Prabhupada has a very special role within the history of the world. We have to remember that his persona and his mission was not the process of a struggling jiva who attains liberation through the practice of raganuga sadhana bhakti. He is a nitya siddha who came to walk amongst us to teach us the path back to Krsna. It is only in this perspective that we can understand our place in this world and our place in the Vaisnava Society that Srila Prabhupada established that is ISKCON. Lastly, the fact that in the past the GBC and Rubber Stamped Gurus have used foul methods to intimidate and kick out devotees has changed to the more insidious ‘excommunication’ procedure of the ISKCON Law Book, does not mean that either of these methods can nullify your Krsna Consciousness or separate you in any way from either Srila Prabhupada or ISKCON. The GBC cannot kick anyone out of ISKCON or cut anyone off from receiving the mercy of Srila Prabhupada. 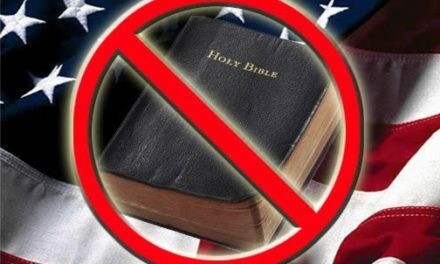 The choice to excommunicate yourself, is yours alone to make, and has nothing to do with the errant GBC or the Rubber Stamped Gurus. Sure they can cut you off from using the facilities of the Institution, but that, in light of the present problems, may not be such a bad thing. This, although unfortunate, should not sway you from your service to the pure devotee Srila Prabhupada or ISKCON. There are many thousands more of you who have no desire to serve the Institution of ISKCON in its present form that you can associate with. Above posits the idea that if ISKCON is corrupt then it is best to leave it and establish another ISKCON or an ISKCON affiliate outside of ISKCON. Here many of the followers of such projects perceive themselves as operating outside of ISKCON. Here the concept of ISKCON becomes blurred. ISKCON is the International Society for Krishna Consciousness and the key words to understanding this is International and Society. Society means; an extended social group having a distinctive cultural and economic organization. So Srila Prabhupada established a worldwide extended social group of people sharing a cultural and economic base under his direct leadership. A society is comprised of individuals who share a common goal. 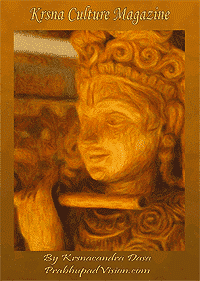 The Worldwide Society of ISKCON is already established and functioning. Anyone who shares the common goal of becoming Krsna Conscious under the auspices of Srila Prabhupada is a member of ISKCON. It is as simple as that. So with this in mind, where is the possibility of leaving ISKCON if we all have the same goal? And so on – is redundant when we all share a common goal. If we share the same goal and we love and desire to serve Srila Prabhupada, then there is no question of saying or believing that we have left ISKCON. The only people that should have this conception and need to be truthful about it are the so called ISKCON GBC /Gurus and BBT Trustees who are a part of FISKCON or Fraudulent ISKCON. They are the ones that have left ISKCON. The others, no matter how far they have gone away from ISKCON, must now believe that they have never left ISKCON. Srila Prabhupada is deeply imbedded in their hearts, their minds and their intelligence. He is the singular point of reference and pivotal point of their lives, no matter how much they may hate the individuals in the Institution of ISKCON that have wronged them. If Srila Prabhupada is in your heart still, then you are a member of ISKCON. Advocates perceive that the only way to effect change the system is to work within the system. If of course the system is open and progressive then this practice can be entirely possible, however, in corrupted or authoritarian structures this practice is rarely successful. The very nature of a corporate structure is to force and coerce individuals to conform to their policies and programs. Many devotees have in the past attempted to change the system from within and have been disheartened. The institutionalized system that the errant GBC and Rubber Stamped Gurus have implemented into ISKCON needs to be treated similar to milk that has been touched by the tongue of a serpent and necessarily any attempt to work within the system must be avoided. This is especially stark when one comes to realization that the ISKCON leadership no longer represent Srila Prabhupada’s ISKCON as they have internally converted it into their own private society – FISKCON. Srila Prabhupada created a Vaisanava Society that is managed materially and spiritually by the GBC and Sannayasis. Not this Institution that has been created by independent individuals who believe that they know better than Srila Prabhupada. An institution managed by errant GBC and illegal Rubber Stamped Gurus. To operate within the institutional framework will only help the Bad Guys. Is that what you want? Consider the idea that if we love and desire to dedicate out minds, hearts and hands in the service of Srila Prabhupada, we must never have the mentality that we need to or have to leave ISKCON. We need to find ways in which we can come together to meet the challenges that face us in order to affect any positive change within ISKCON. In order to do this we must be able to perceive exactly what ISKCON is and what it isn’t. The next thing that must be done is that we must be involved in a non compliance action against the present ISKCON leadership. If one was to notice as the years go by the institution is caring less for the things that connect the devotional community to Srila Prabhupada. No longer is there much interest in Book Distribution and street Hare Nama’s. The emphasis is on securing Hindu compliance and their dollars. As the society depends less on Book Distribution it depends more on the Hinduization of ISKCON. You don’t need to be a rocket scientist to see this occurring. When the Indians themselves begin to wake up to the ploy of the errant GBC and Rubber Stamped Gurus and see that there is a difference between ISKCON and FISKCON then they too will be circumspect as to how they donate their hard earned money and well deserved time. When they see that the money that they donate is going into the coffers of the Guru’s who control the Temple that they are donating to and not to the regular seva puja or the ISKCON society as a whole, they too will stop giving. Well that is if they are sincere. 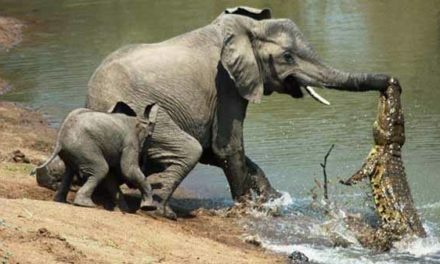 Indians have a very giving nature when it concerns the karma kanda section of the Veda’s. But this is not why we Vaisnava’a are here; we are here to show them how to go back to Godhead, to be with Krsna. They too have had Srila Prabhupada obscured from their vision and education. They too need to have their spiritual eyes opened by learning the true mission of Srila Prabhupada and not be brought into the money racketeering system of the GBC and the Rubber Stamped Guru’s. The GBC and Rubber Stamped Gurus have their way now, but this can be turned around inside ISKCON. The best way to do this is to begin full scale distribution of Srila Prabhupada pre 1977 books from the BBT that Srila Prabhupada established. Books are the basis both philosophically and economically. The more Srila Prabhupada’s original books are distributed, the more power the errant GBC and Rubber Stamped Gurus will lose. This is a simple fact. Once the money comes back in from Book Distribution, the Hindu population has less of a say in the running of Srila Prabhupada’s Temples. This will be the pivotal point in the resurgence of loyalty to Srila Prabhupada and effective change within ISKCON. The solution lies in our hands. In the Kali yuga, the power is in the money. The Indians have the money. Srila Prabhupada established Book Distribution as a way of financing our Society, we need to kick start this program again. When devotees start to distribute Srila Prabhupada’s pre 1977 books in the tens of thousands then the BBT will have to change. There will be no doubt about this. When the BBT changes and begins to print these books, we will become enthused and there will be money flowing into to the Temple. Then the Temples will have to change as well. Book Distributers will again have more influence at a local level. The Indians will also be enthused as they will see full time devotees being involved in the Temple and they will give donations that will not be based on the greed of the GBC and Rubber Stamped Gurus.